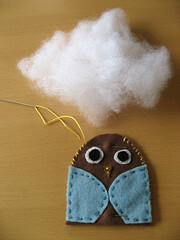 You may or may not be aware, but some time ago I posted a tutorial on Youtube on how to make an owl. It was ages ago, and to tell the truth, I am loath to point it out to you. :) I posted it to share with a friend who asked me to put together a little something for her. I knew it was public, but I thought to myself, out of all the cute cats, charming musical acts, and pirated tv shows, who's really going to bother to watch this stupid owl video? What amused me most, this morning, was looking at the complex and fascinating hierarchy of comments that have appeared on my little owl video. At first, mean comments used to bum me out, and I wouldn't publish them. But, I cracked up when I saw towaandes3's comment "that was boring" and just approved it. look! you guys are nice! 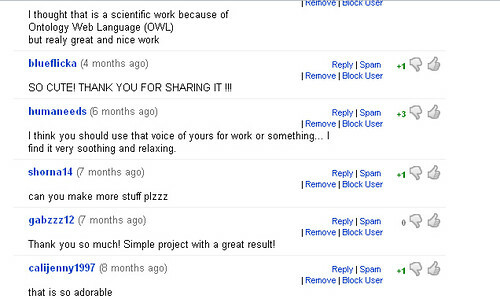 I also liked that 6 people voted up the cute comment - Your voice is so "tiny"
Well, even more amusing are the emails I get from this owl video. Ladies, looking for online love? Post an owl tutorial. Seriously.